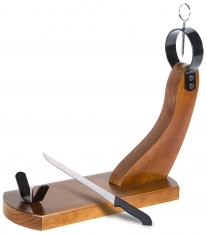 This acorn-fed iberico ham is a product of the highest quality, a treat for the senses. Pigs raised in our Rodrigo county pastures are fed exclusively on the sweet acorns characteristic of the area, resulting in an unforgettable and unmistakable flavour. In Spanish, this product is called, "Jamón ibérico de bellota Ibéricos Dehesa Casablanca entero." A family business that has been dedicated to searching out the highest quality acorn-fed iberian pork for over 20 years, Ibéricos Degesa Casablanca uses limited production and artisanal techniques mean each handcrafted piece is both excellent and unique.Iberian pork products to satisfy the most demanding palates are produced in modern facilities in Salamanca that meet European Economic Community guidelines, combining the best of tradition and modernity to deliver unmatched excellence to you. 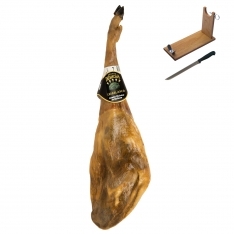 Format : This acorn-fed iberico ham comes with a greaseproof wrapper, elegant golden netting and a black outer carton. Storage : This acorn-fed iberico ham should be stored in a cool, dry place. Consumption : The time in which you should eat your ham depends on whether it has been opened or not. You can store an unopened ham for up to a year. Once open, consume within three months to avoid dryness. "El jamon estaba muy bueno. Para mi gusto un pelin salado pero muy bueno. A mi mujer le encanto."